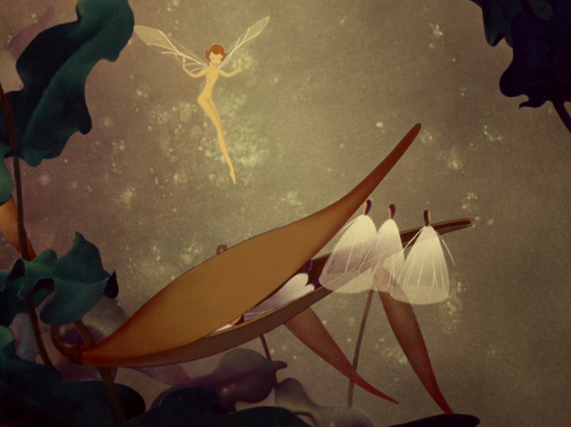 Fantasia is a film that proclaims its own greatness. What does that mean? That it opens itself up to charges of pretension, of being overblown "white elephant" art, but also that through its ambition it opens up new horizons, elevated peaks for the viewer to explore. My own relationship to this sort of movie, and this movie in particular, has shifted back and forth over time. I've always had a soft spot for the epic and larger-than-life; I like the lofty heights it aspires towards, its Apollonian contemplation of the transcendental. But the moment something is "off," the moment a film like this doesn't click with you, the whole facade comes crashing down like a house of cards. Unlike a smaller film which can sneak up on you, grow with time, overtake you the self-consciously great film is all-or-nothing. Fantasia used to be my favorite Disney film, but it doesn't work so much for me anymore. Yet it utterly fascinated me as a kid. If I had a scanner, I could post a picture of me standing next to a blackboard at about six, the blackboard sliced into fragments by the chalk, each fragment containing my sub-par artistic attempt to ape a sequence from the movie. I hadn't seen it at this point, but I was enthralled by the notion of a movie that contained multiple movies within itself. Obviously that attraction hasn't faded with time, as recent entries on Citizen Kane and The Decalogue have shown. But Fantasia does have a certain unevenness and imposing quality always reminding one of the big picture (Decalogue can be taken on a micro or macro level depending on mood), and the fact that it does not seem unconscious (the way something like Snow White, perhaps misleadingly, does) makes it difficult to approach on a purely visceral level. The movie is always proclaiming its intentions, and depending on one's mood these either inflame the proceedings with a heightened vigor or alienate the viewers by not letting them forget themselves and the movie (anti-escapism if you will). Piece by piece, reactions now, then, and in-between... Toccata and Fugue. As a really little kid, I was bored. Nothing to relate to (although if I'd been even younger, in a pre-verbal or early-verbal stage I might have been enthralled by the colors and sounds). It probably didn't help that we watched it in music class at elementary school. But a bit older, and its adventurousness appealed to me - it was like a first taste of the avant-garde, and the fact that the images could be abstract, and thus spur the imagination without tying it down, quite excited me. While I don't think I'm as swept up in it as I once was, I absolutely love those undulating lined hills - moments like these are where Fantasia best achieves its intuitively rhythmic aspirations. Also the cathedral-like (some would say phallus-like) arches which the sequence ends with...they remind me of the Emerald City in Wizard of Oz. The Nutcracker Suite is one of the most charming sequences in the movie and one of the most successful in "matching" the music. The connections between the different plants and animals and the ethnic stereotypes they are supposed to represent (complemented by the music which takes obvious national themes) are clever and entertaining, as are the little touches like the out-of-step mushroom. This is probably the sequence that is most like an early Silly Symphony, in approach if not in specific animation style. A confession, though: at this point in my life, I respond more to the gutsy, slightly vulgar gaudiness of a thirties cartoon than the more self-conscious, "refined" approach taken here. Still, it's quite pretty. The Sorcerer's Apprentice actually did start life as a stand-alone cartoon, and its expense is part of what spurred the production of Fantasia in the first place. 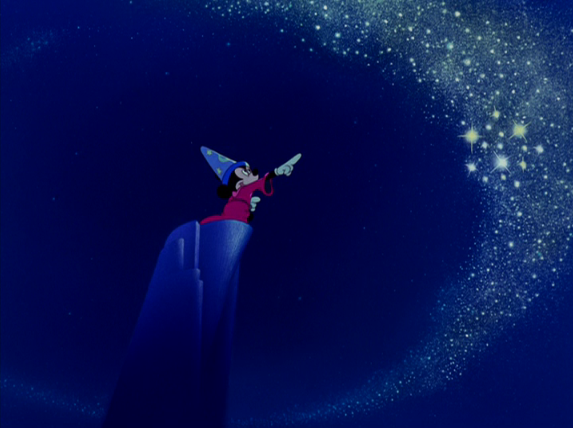 I like Mickey's dream, where he soars up to the top of the mountain and commands the wave. Otherwise, the new forties vision of Mickey seems to lack to the dynamism of the jauntier, jerkier rodent from ten or even five years before - here's another case where I find myself missing the rawer Disney style of yore. The Rite of Spring was easily my favorite as a little kid, for the obvious reason: dinosaurs, dinosaurs, dinosaurs! (Even if the 7-year-old me knew the T. Rex didn't have three fingers, and its tail didn't drag.) Then, as a teenager, I fell for Stravinsky's composition in its own right and yes, like Igor himself I found the ponderous dinos a distraction from his propulsive paganism. I still miss a bit of the vigor the music itself conveys, but now I'm rather impressed by the sequence's darkness: its Darwinian vision of life (or almost reverse-Darwinian: this is a tale of brutality and extinction more than growth and adaptation) is as far as Disney ever got from the sentimental. Beethoven's Pastorale gets the most flak - it trivializes the great master with prancing centaurs and cherubim, and its animation is the least impressive. Perhaps it was simple perversity or just low expectations kicking in, but I enjoyed it the most this time. Yes the images themselves are corny but, especially in the first half, there is a graceful yet unostentatious synchronization of music and images that achieves an appealing bounce absent in some of the other chapters which appear to be trying "too hard." The colors are also gorgeous, however unsubtle, and there is something refreshing about seeing the animators relax into comedy and broad cartoonery after trying so hard, and so self-consciously, to impress. Probably the best sequence in the film is Dance of the Hours. Here the old Disney spirit reappears in full form: the playful anthropomorphism, the witty musical timing, the scatological humor which always characterized Uncle Walt's bum-oriented slapstick. I'm sure it helps that the music was originally intended as a ballet, so the artists have a template to work with. Their inventive variations on this template are hilarious - the ostriches swallowing fruits whole, the hippos "gracefully" flitting about in their tutus, the elephants blowing away in the wind like so many feathers, and especially an alligator pantingly expressing his love for the rotund ballerina - grace and slapstick have seldom been so wittily intertwined. Finally, we close with a double feature: Night on Bald Mountain and Ave Maria. A fascinating short piece on Bright Lights After Dark recently examined Fantasia as a cycle of creation stories with various religious or cultural sources, so it makes sense (as a work of Western art) that the movie ends with the duality of good and evil, pagan black magic giving way to holy contemplation, or as Deems Taylor puts it, the profane to the sacred. Bald Mountain is stirring, captivating stuff (Kenneth Anger must have loved this as a kid) but a bit of the sheen comes off when you realize how closely it apes a French pinscreen animation from the 30s, which uses the exact same music and imagery. Still, realized in color with an appealingly sketchy quality (foreshadowing the animation style of the 60s and 70s), there's some unforgettable imagery here. Without cutting back to the orchestra for contextualization, the Mussorgsky gives way to the Schubert as dawn turns Bald Mountain into a barren rock devoid of life. The simplicity of the animation is appealing in Ave Maria, carrying an iconic quality reminiscent of medieval art (I like the way those candles they carry don't flicker, glowing in a permanent fixed yellow circle). In this meditative mood, the film ends like a spell dispersing in the morning air, and a thought occurs to me: I missed Fantasia on its big theatrical re-release in 1990, and I've yet to see it where it really belongs - on the big screen. Perhaps some of the films that have worn out their welcome with me over the years, the ones that seem too loudly to proclaim their bigness but whose smaller charms are too fleeting or drowned out by the size, would recapture me in their proper home. Fantasia on the big screen, I suspect, would reclaim its greatness in my eyes. The spectacle might overwhelm again. In the meantime, I can respect the ambition and recollect prior enchantment, but I can't really fly away with the film. Make sure you check out Bill Benzon's exhaustive, and fascinating, analysis of the film on his own blog, New Savanna. Really great stuff. And click his "Fantasia" tag because there's plenty more where that came from. Fabulous childhood remembrances greatly enrich this brilliant and passionate examionation of one of the great screen masterworks, one that brings fresh new interpretations upon every new viewing. The music of course is sublime, and in every sense it is one of the most intricate of all the Disneys.